If you're too lazy to read my SSX 3 preview, check out the new trailer we just added for the game. It highlights some of the game's best new features. To download the movie, please make a visit to the media section below. The first two SSX titles provided just about everything that a gamer could want in a snowboarding game, so what can EA Canada possible do to improve the franchise? Add a dose of Grand Theft Auto and Tony Hawk's Pro Skater 4 into the gameplay, of course. Players will start on a very large mountain (with three peaks -- kinda like GTA3's three islands) and he or she will be able to reach a venue or competition of their choice by traveling there, instead of selecting it via a menu. Competition events include race, big air, slope style, and super pipe. To keep you busy, SSX 3 will offer over 100 challenges placed all around the mountain as well. For example, one challenge will require you to successfully grind a billboard high in the air. Players will also be rewarded by actually exploring every nook and cranny of the mountain because special items will be hidden in various areas. If you miss something, you can use the ski lift to go back up top and try again. Uber tricks (which can be performed on rails now) are making a return in SSX 3, but the aspect that really has us stoked are the new board press tricks. These are like the manuals in Tony Hawk 4, so if you execute a board press right after a trick, you can string tricks together to create a long combo for huge points! Needless to say, Tony Hawk veterans should feel right at home with the new board press maneuver. 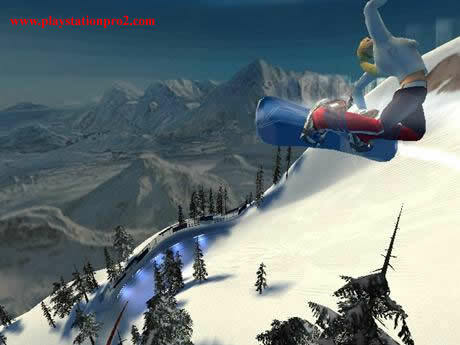 All in all, SSX 3 has 10 boarders total, with six of them from the previous games. Elise, Kaori, Mac, Moby, Psymon, and Zoe are all back and they will be joined by characters named Viggo, Nate, 12 year old Griff, and Allegra. SSX is also known for its great music, so expect songs from the X-Ecutioners, Felix Da Housecat, Queens of the Stone Age, N.E.R.D, and more. We'll have additional details on SSX 3 soon. Click here for all the screenshots and movies for this game.